NUS librarian Aaron Tay runs a very informative blog called Musing about librarianship. 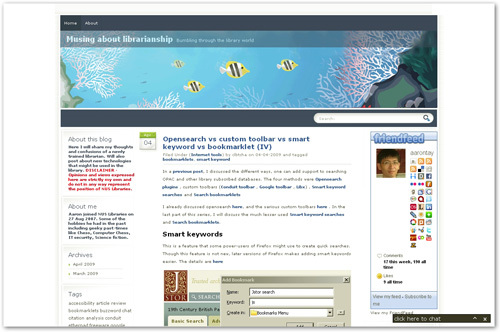 Besides musing, Aaron shares about technology and how the latest developments on the web can be employed by library users. Besides blogging, Aaron twitters too. Looking at his updates, you wonder when the man goes to sleep! I stumbled on the NUS Career Center's YouTube channel yesterday. Their channel is a combination of an audio podcast (those are indicated with the NUS Career centre graphic) and on-the-ground coverage of NUS Career Fair 2009. This is the second self-started YouTube channel by an NUS department. NUS Libraries was the first department to foray into YouTube. Besides these departmental channels, NUS also has an official channel on YouTube. 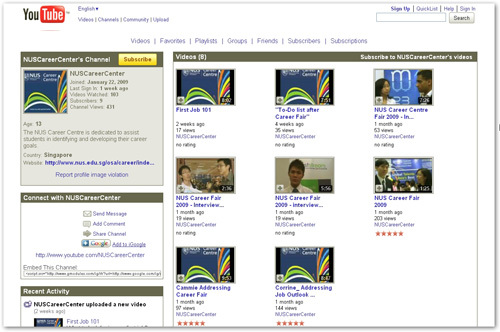 Posted in Monday Movers and tagged blogs, nus career center, nus libraries, youtube on 6 April 2009 by Kenneth PINTO.